Can you believe August is here? Let’s kick off the last month before fall 2017 right with a back to school giveaway! Enter at the bottom of this post to win $50 of school supplies! 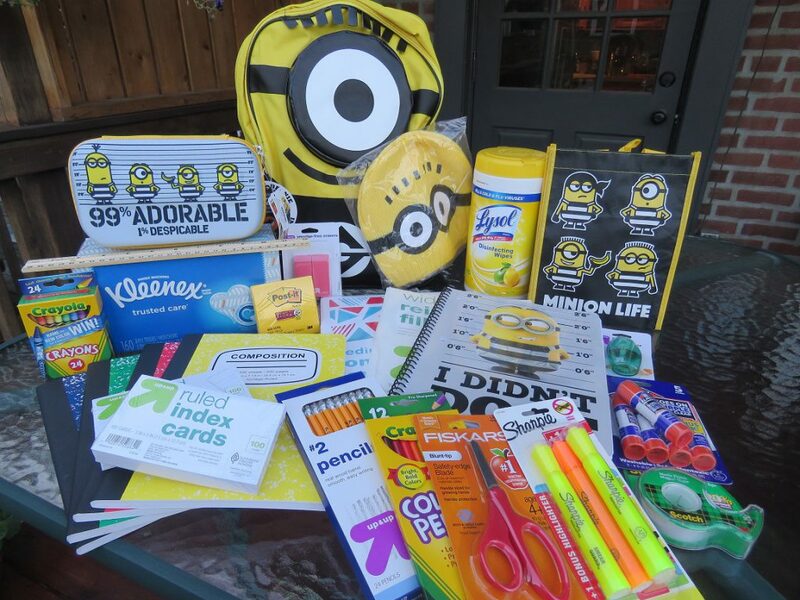 We are giving away $50 worth of school supplies (exact items pictured) . If your child is a fan of the Minions, they will particularly love the Minions backpack and a few other items from the movie that we found. There are a number of ways to enter (U.S. Residents only) – complete them via the giveaway widget below. Entries will close at 11:59 PM EST on August 15, 2017. We will contact the winner (chosen automagically by the giveaway widget) on August 16th. Terms and conditions apply – see widget below for details. This year has flown by, hasn’t it? It seems like just a few days ago that we were sitting down at the Thanksgiving dinner table for turkey, stuffing and football. We have had a pretty busy spring and summer – We can’t believe it is August 1st already. September will be here in the blink of an eye! We bought our first Halloween candy of the year on Sunday and we’re excited about this fall. We’re excited about all of the things that we normally do – fall festivals and pumpkin patches and a Halloween party, of course. But this is also the fifth year that we’ve been running Funtober. We expect the website will be more popular this year than it ever has before. In past years, we’ve had a pretty hard and fast rule that we start Funtober activities on September 1st. But we decided this year that we were willing to make a few exceptions for the people that truly love fall so that we can share our excitement with you. One of those formerly fall (and now summer) activities was Back to School shopping. We went to Target on Sunday and shopped the back to school section. We were definitely early – since there were no crowds – but we were not the only people buying school supplies. We set a $50 budget for the giveaway and we ended up breaking it – by four cents. 1 Accessory Innovations child’s minion backpack and yellow stocking hat. We’ll have another giveway when this one is over – So check back soon! 25 items worth $50?! Including a backpack? Well done!! Im getting married in November so I am really looking forward to that. This would be such a Blessing!!!! I’m looking forward to fall because I love the change of the weather, the color of the leaves Halloween and Thanksgiving and I also love wearing my jeans and sweaters. I am looking forward to fall this year because I love watching my kids play soccer, I love the cooler weather, and Halloween! Thanks so very much for the chance to win this awesome prize! I’m looking forward to fall because my oldest is starting college! She’s so excited & she’s so ready! Thanks so much for the chance, its been a hard years!! Hey maybe I will get lucky cause you are picking on my brithday!! I love the cool weather, pumpkin patches and picking apples, just to name a few favorite things about Fall! This would be awesome for my grandson. He’s starting school this year. I’m looking forward to the fall because I’ll be visiting my sister in Florida. Such a cute idea & very generous! I am looking forward to holiday parties. I love getting back on a schedule! My Granddaughter would love to have this for school! My 5th wedding anniversary is in the Fall. I’m looking forward to pumpkin spice lattes! This would be awesome to win. Daughter is starting kindergarten. This would help a lot! Good luck to everyone, and thanks for the chance to win. I’m looking forward to the cooler temps as it’s been a very hot summer. I’m also looking forward to going to Apple Hill and picking apples this Fall! I can’t believe its time for school again. The summer went too fast. But help with supplies is huge help to our budget. I’m looking forward to being on a schedule!! I’m looking forward to seeing all of the leaves change color. We cannot wait for the pumpkins, thank you so much!! It’s my favorite season for all the leaves, pumpkin food items and great walking weather. I’m looking forward to going to our favorite lake and spending time together 🙂 the kids have a blast and my husband and I do to. I like fall because it is really beautiful here and early fall at least is mild. I AM REALLY LOOKING FORWARD TO COOLER WEATHER. I’m looking forward to the fall colors and taking a nice day trip to enjoy them. Who couldn’t use back to school stuff? Living In Arizona I can’t wait till it cools down! My son and I we both love fall because is chilli outside and I love the tree when it changes colors. Home school my babies, so this would be super cool! I enjoy the kids going back to school during the fall and getting crafty with Halloween theme. My daughter and my 3 grand kids are moving back from SC!!!! I 💙 Fall because of cooler weather and football! This would be awesome and help us a lot! I’m looking forward to fall because the scenery here in the hills of WV is astonishing! This is an awesome giveaway, I am ready for fall, the trees change colors it looks so beautiful outside in the fall, however with that being said, I will also miss the warm weather it seems like everything is going by so fast. This would be super duper to win, I am single mom disabled this would sure help me out. We love fall because we go to several different apple barns, and pick apples. Plus let’s not forget the Apple cider! This would be an amazing prize pack for my son. He loves minions!! I am ready for the weather to get nice instead at sticky hot. I love to watch the leaves change color. I look forward to fall because it’s FOOTBALL season! I also love taking my LO to all the cool fall festivals and apple picking. Plus, I enjoy the tastes of fall, as well. I can’t wait! I can not wait for bonfires, hayrides, and Halloween activities with the kids. I am looking forward to the cooler temps. Fall is my favorite time of year. I love the smell of the air. I also love viewing the changing of the leaves. With 13 grand children it seems so overwhelming for the parents (my children) to provide the most basic needs for back-to-school. The grandchildren know that this grandmother (OHMA) enjoys having the opportunity to spend one day with each child to shop for one set of new school clothes. It is possible for me to provide one new set of school clothing as long as I save from the start of the New Year and through the summer break. I encourage the grand children to help me with any household chore or yard work so they have a little extra for new shoes or special school supplies they each have had their heart set on. The new set of clothing lightens the anticipation of returning to school and they carry a sense of pride through the school day. The list of supplies seems to have grown and filling those needs is overwhelming for us all. To receive a gift giveaway as significant as these “back-to-school supplies” would especially be appreciated by either of my grand children, but a particular blessing for my sixteen year old grand daughter who begins her Freshman Year as a High School Student who dreams of a college career in New York. This is great. It would be a huge help for anyone. I am looking forward to craving pumpkins with my kids. Only thing excites me about fall holidays and celebrating my sons B-Day. I’m looking forward to fall because of the cooler temps and back to school! I look forward to Fall every year because of the cooler weather, bonfires, the smell of the fallen leaves, and no pulling weeds. I’m looking forward to cooler weather, raking leaves, Halloween, all of it! hoodies, hayrides and pumpkin spice everything!! I am not a fan of summer heat, so I look forward to the coolness of fall and its beautiful colors! I love the weather in fall, the colors of the leaves changing and all the yummy fall food! everything! the weather, the food, the clothes, school, the decorations, i want it all! I am looking forward to sports, especially football! We love the Minions! You all made the perfect selections for this giveaway! Tell cooler weather is always a great relief! Cool minions stuff! So many useful school supplies here! Very awesome! I don’t care for fall as winter comes next but the good thing is no more mowing and yard work. I can’t wait until the kids are back in school. The smell of school is in the air! Remember those stiff blue jeans on the first day! Awesome on a $50 budget! I am looking forward to the cool crisp air and leaves all over! Pumpking spice everything too!! I am looking forward to spending Thanksgiving in the mountains with my family! My husbands birthday is in the fall so that’s what I’m looking forward to most in the fall. I love the fall scenery! I’m excited for the cooler weather, Fall fashion and decor! I love the weather not too cold or hot. Its perfect weather. Fall is probably my favorite season!! I’m looking forward to fall because I love the weather, love seeing my kids dress up for Halloween, and Mother Nature is just beautiful!! There is a highway here in Kentucky that we can drive about 30 minutes and see the most beautiful trees & leaves during the fall months! Thank you for this amazing chance to win! The lucky winner is going to be so happy!! Fall is my favorite season! I love the smells and the colors and Halloween! I am looking forward to the fall because that’s my favorite time of the year. I Love the changing of the weather, the crispness in the air. Sweaters and scarfs, leaving changing colors, and the holidays will soon be here. It’s been really cool here in East Tennessee of the mornings. It’s making me long for homemade apple cider and a pumpkin roll!! Awesome prizes. Love that this will help the kids. Less stress in going back to school. I would love to win this to help my grandchildren get ready for school! Thanks! Fall is the best season by far and it means halloween is around the corner!! Fall is a fresh start with cooler weather, beautiful leaves, & a time to look forward to family times together. This prize would be so awesome as my husband’s job position has been changed and the income has been reduced by third and back to school is really hitting us hard this year. I think this is so cool. My daughter really loves sponge bob. I wish everyone good luck. Because I know I can really use this for my kids. This would be amazing. Thank you Funtober for the Fun chance. Good luck everyone. I’m looking forward to Fall because it is my FAV season of all. I love wearing sweatshirts and jeans, and I love going for a brisk walk in the early morning. I love watching the leaves change colors. Love everything about Fall!!! God bless everyone! Wow, I’m loving the excitement. I would love to win this awesome giveaway for my son. He’s obsessed with minions. I am looking forward to fall for back-to-school, falling leaves, hot tea, HALLOWEEN & great sleeping weather! I am looking forward to my daughter’s birthday, Halloween and cooler weather. It will be my 18th wedding anniversary on October 30, one of my most favorite days. I’m really looking forward to getting back on my regular schedule and getting to hang out with my friends every day! I am looking forward to fall because it will be a relief from this hot, humid weather! I’m looking forward to fall because it’s my favorite season, my oldest daughter will be starting 3rd grade & is excited about it, my youngest daughter is at the age to enjoy all the fun fall activities, and we will be completing our family with a little boy! Less humidity!! I love Halloween and that always excites me. Would love to win this for my son and his wife’s four children! My birthday is in thr fAll. And of course the kids go back to school so peace and quiet. my favorite things about fall is back to school and halloween!! my kids would love to win this giveaway!! I’m looking forward to Fall because of cooler weather, kids go to school, and pumpkin flavored every thing!!! Fall is my favorite time of year. I love the colors, smells and cooler weather. Love everything about dal… Pumpkin picking, Halloween, fall colors, weather!!! Can’t wait for fall!!! I love fall we love to play in the leaves and have fun nature walks enjoying all the beautiful colors it is just a perfect time of year to explore the great outdoors. I look forward to fall because I LOVE decorating for Halloween! I can’t wait to watch to kids walk to school this fall. I always look forward to all the Pumpkin flavors and I love Halloween!! We are going to the White Mnts. this fall! This will be the first year my daughter gets to do all the fall activities by herself, like picking a pumpkin and going for hay rides! I love fall. I love the cool crisp weather. Turning off the AC! And I love the months leading up to Christmas!!!! We are going apple picking. I am looking forward to Thanksgiving! Cooler weather and pretty fall leaves. Looking forward to meeting all the new students and teachers! I am looking forward to fall for the cool weather and the pumpkin cheesecake at olive garden! I hope i did this right, entering the contest that is. This would be amazing if my kids were able to win this.. I really hope I did this right, this would be amazing to win, any thing helps..
I’m looking forward to the cooler fall temps and Halloween! Thank you! I am looking forward fall this year because of the much cooler temperatures and pumpkin everything. Carving pumpkins with my nieces. Thanks for the chance to win. Thank for the opportunity to win. I am looking forward to cool weather, Halloween fun and my birthday. This win would be awesome for my daughter! I am looking forward to seeing a brand new classroom filled with eager faces. I love being a teacher! I can’t wait for cooler weather and fall festivals! The cooler weather and the season in general is my favorite! I’m looking forward to the cooler temperatures. It would be awesome to win this and give it to my Goddaughter. Thanks for the chance! !